Included in the package is accommodation in a Deluxe Room, free daily buffet breakfast in Momo Café, a THB500 credit for use at the resort’s food and beverage outlets and a 20% discount on all Spa treatments for the duration of the stay. The “Hot Summer, Hot Offer” is valid until May 31 and must be booked by April 30. All resorts also have spacious swimming pools, well-equipped gyms and are just metres away from some of Phuket’s finest beaches and close to the island’s shopping and restaurants districts. 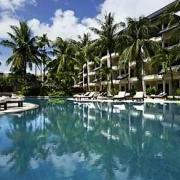 The Patong Beach resort is also home to the internationally renowned Hard Rock Cafe.